Macaws are such awesome birds, many people commonly refer to them as just parrots. They are a specific group of parrots, i won’t go into all the latin list of names but suffice it to say they are in a class by themselves. 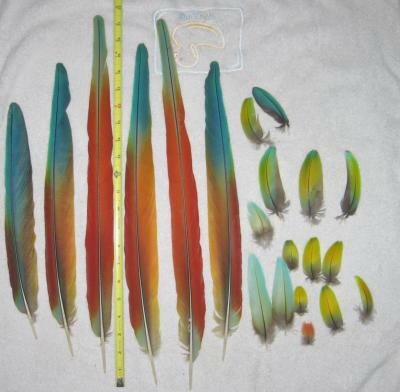 Macaws range in size from 400 grams up to 1500 grams thats over 3 pounds. The most striking feature in any macaw is thier color. From deep red and blue to green, orange and yellow they are truly beautiful birds. My macaw is named Autumn. We got him from a pet store that was closing and did not want him to and up in the corner of some house with no one ever giving him attention. So now he is with me. 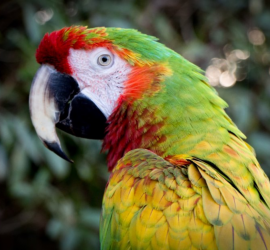 Autumn is hybrid classified as a Verde Macaw, which is a cross between a Scarlet and a Great Green. Both of these birds are large in size which is where Autumn gets his 1400 gram weight. I take him to a specialized avian vet every year and he, thankfully, is not overweight. The vet said, “he is just a big bird”. So far he has been the largest bird, by weight, that the vet has seen. The big question that I always am asked is, “does he talk?” Well, yes he does, but not when you want him too. Making a regular parrot speak on command takes training and a bird that is willing to be trained. Scarlet macaws, are very head strong and are not always easy to train. Yes with Autumns size also comes a big attitude. He does say: hello, hi, little bird, brat, pretty bird, come here, come on, hercules (my wifes dog) and Hi Autumn. He also meows like a cat, growls like a dog, and clucks like the cadbury bunny. He does watch way to much tv and laughs at slapstick comedy and people being punched. Some of his details include: head to tail length of 42 inches, wingspan of 56 inches. His colors include red, orange, yellow, green, dark blue, teal blue, black and white. He was born in July of 1993 which makes him 18 years old. With his size he may not live as long as some other macaws but we estimate that he will live to be 50 years old. 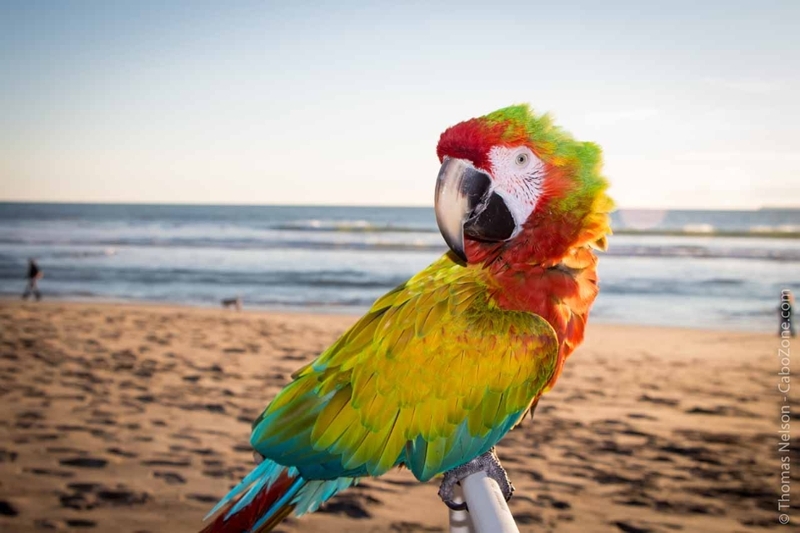 The real problem with many of these birds that are taken home is that people are not told the requirements necessary to bring a macaw into the family. That is what you are doing, the bird will eventually consider you to be part of his flock. When you leave the room they will call to you. Kind of a sounding to make sure that you are O.K. and within close proximity. If you dont answer they will call louder and then begin screaming. If you don’t understand this behavior then you end up with a constantly screaming macaw. They want to be part of your family. Most macaws will bond deeply with one person, as Autumn has with me. He wants to be with me wherever I go in the house, and I often take him with me to the pet store. People often bring home the birds and give them several hours of attention a day for the first several months, as the newness wears off interaction with the bird is lessend. 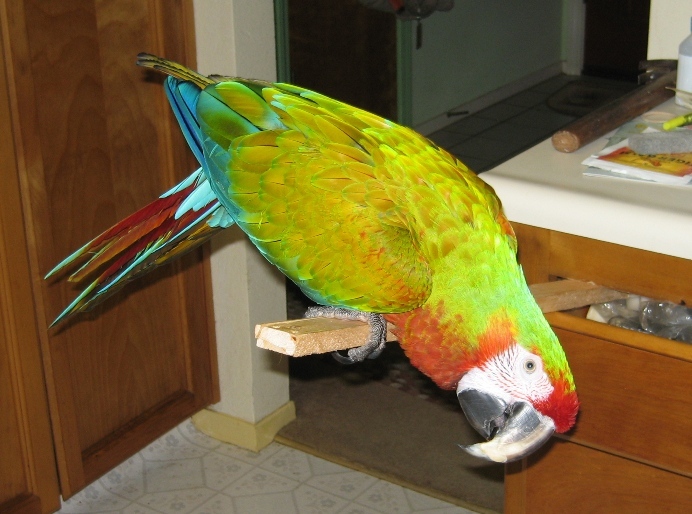 The problem is that the Macaw is used to several hours of attention and begins to act up. It is a commitment, that you have to spend time with this emotional feathered friend. Autumn has perches in most rooms in the house and goes with me as I am doing different tasks about our home. We have seen birds left in cold garages bearly given enough food to live, one parrot was left in a dumpster in the back of the pet store where my wife used to work. Not a life for one of the most intelligent animals in the world. As much as I believe that these birds need to be left in thier natural habitat, there are still those that are bred and sold here in North America. What can we do? Educate people about what a commitment it is to have one of these beautiful creatues in your life. Because that is what it is, a life long commitment to care for this intelligent, colorful, emotional, playful macaw.